CBI Ultra Duty Speaker Cables provide C-184 high quality large barrel 1/4-inch connectors and 12 gauge wire for premium performance. Your power amps and speaker cabinets will thank you for upgrading to 12 gauge cables. 10 year warranty. CBI features unsurpassed delivery, flexibility, and quality for the Recording Studio, Live Audio, and Sound Installation Wiring markets. CBI products include many top of the line components, such as Belden cable, Switchcraft, G&H, and Neutrik connectors. CBI's product lines encompass a wide range of professional wiring systems for musical instruments, sound reinforcement, sound installation, audio/video, recording & broadcast, as well as bulk wires, connectors, adapters, and custom designs. In addition to being a well-established and respected force in the retail music industry with over 20 years of experience, CBI has been a pioneer in the field of designer cables and is unparalleled in the custom cable market. 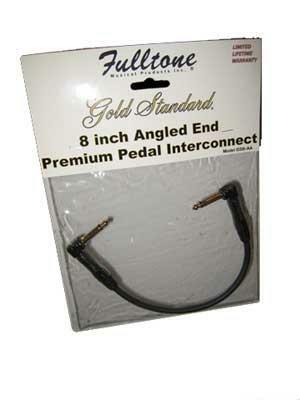 The Fulltone Gold Standard Pedal interconnect cables have angled ends for easy, low-profile connections between guitar effects pedals. 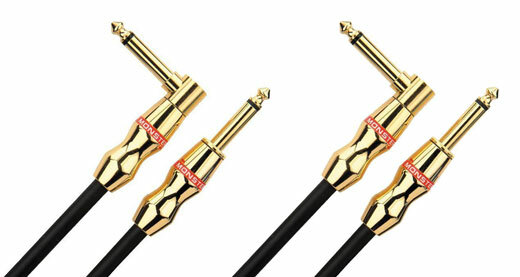 Fulltone's Gold Standard low-capacitance cables with Gold-Plated ends let you keep your High frequency sounds without loosing low-end or mids through longer lengths of cable. The Fulltone Gold Standard series offers very transparent delivery of your guitar's signal. Designed specifically for guitarists and bassists, Fulltone chooses all materials (oxygen-free copper, shield, etc. ), construction methods, and plating for a sound that's great not only for Lows and Highs, but also for the Mid frequencies where all the complex overtones lie, a crucial area often overlooked by other premium cables. Monster Rock Cable features patented technologies help you deliver the power and full impact of your tone. Unlike ordinary cable, Monster Rock uses patented technologies to accent the raw power of your sound so it cuts through the mix. Monster's advanced coaxial design preserves fast transients, clean highs and vivid harmonics while patented multiple gauge wire networks enhance your guitar's sonic bite. A solid core center conductor provides tighter bass response, plus an extra-dense braided shield and carbon-infused dielectric minimize interference and hum. Monster's 24k gold contact ergonomic connectors ensure a strong, reliable connection that withstands the constant abuse of stage and studio. Monster Cable Rock Guitar Cable Features 95% coverage copper braided shield rejects RFI and EMI for a lower noise floor and increased resolution. IsoTec vibration isolation technology further reduces handling noise. Extra-flexible Duraflex outer jacket for superior reliability and cut resistance. 24k 1/4' gold contact connectors with collar strain relief are durable and corrosion resistant. Multiple Time Correct windings phase align signal for natural reproduction of midrange frequencies. MicroFiber inner dielectric provides better isolation of magnetic fields for improved harmonic detail. Ergonomically contoured, heavy-duty body shell is easier to grab and offers hassle-free insertion and removal every time.